Are you excited? 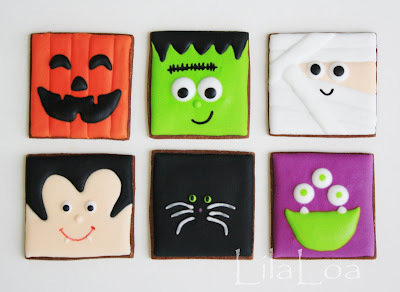 It's the square Halloween cookie tutorials series finale. Anything could happen! I could magically whip up a million cookies and stack them to the moon and then light them on fire and call them a beacon of peace. Or ... not. Actually, that doesn't really sound like a good idea to me at all. I'll probably just stick with the remaining tutorials and call it a day. Ready? Pipe a yellow rectangle on the bottom of the square and a white rectangle on the top. Then stop. And take a break. For at least an hour. You've earned it. Piping rectangles is tough work. 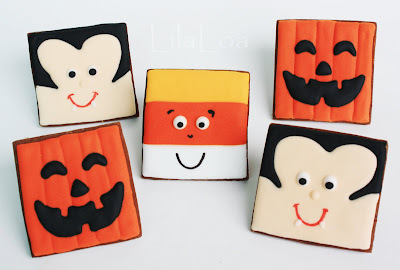 Fill in the middle with orange icing. And then take another well deserved break. This time, maybe work in some snacks. You know how there are some things you're just NOT good at, no matter how simple they seem to be? And everyone else in the entire world is some kind of mad skills EXPERT at it. And you keep trying anyway, hoping that if you pretend hard enough that one day you will be able to fool yourself into believing that you might actually be capable of accomplishing said task. Sewing is like that for me. I can't do it. I shouldn't do it. But sometimes I forget. I wanted to make a purse for my little girl. I was certain I could make it work out this time. I had all the pieces cut out. (And by that I mean I cut out some rectangle-ish squares of fabric.) And then my little boy said, "Good job Mom, you're almost done. Now you just need to NAIL IT TOGETHER." Clearly, he knows me too well. So I gave up and made cookies instead. BUT, as it turns out, piping cat whiskers is another one of those simple things that I just can't do. Who knew? Let's be honest. 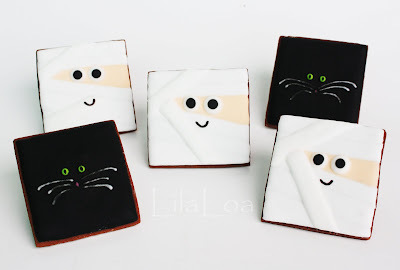 I made a lot of different square cookies. And I, personally, adore those little guys. And I have a tutorial for every single one of them. But you don't love me enough to read one eternally long post detailing each cookie. Not all in one sitting at least. So I broke it up into pieces. But in a good way. Not in a China vase falling off the top shelf kind of way. Oh, and for all of you that don't know this -- I use just ONE consistency of icing. It's roughly 12-15 second icing. But do what you want. If you like your cookies with a piped outline and a flooded middle, then go right ahead and do that. Just outline each area first and fill in. You know, just like you always do. 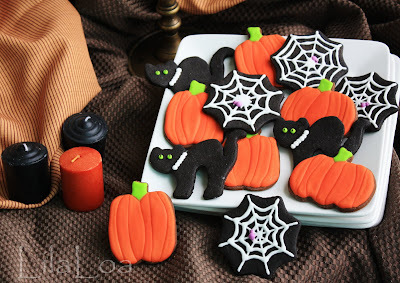 Halloween Cookies --NO cutter required! 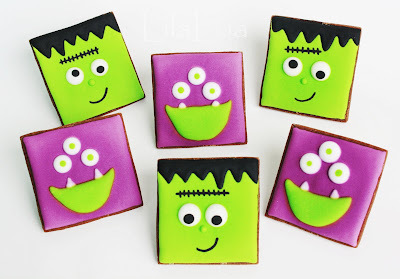 Cute and easy decorated Halloween cookies that DON'T require a cookie cutter!!! 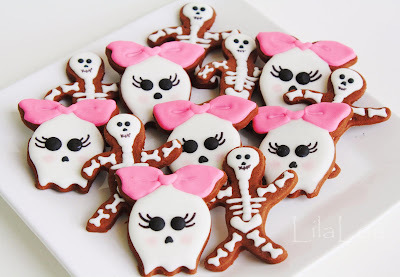 I have been wanting to make Halloween cookies for way longer than is culturally acceptable this year. I'm still not completely sure that it is, in fact, okay yet. But I have two excuses. And I'm just going to pretend that they are both valid reasons for messing up the seasonal continuum by forcing fall holidays to be celebrated during Beach Season. 1) It dropped about 10 degrees here and all the humidity in the entire country went to Japan. Or somewhere else that is decidedly NOT here. So, you know, it's basically fall in Korea now. You know how your car stops you from going more than 140mph because it has a governor? I need that. But for cookies. Isn't there some kind of warning light I can buy? Maybe with a little siren and a British voice that says "STOP NOW." 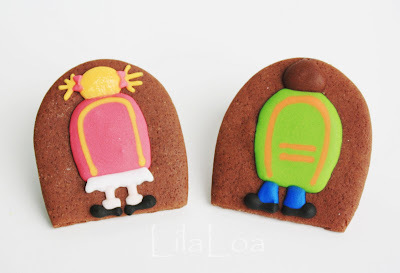 See, I wanted to make some back to school cookies. I'm running out of time, I know. But I really wanted to do it anyway. I settled on something simple. 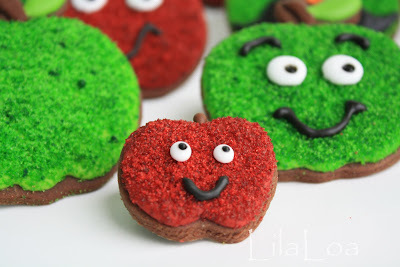 I made some apples. They were cute. I added a little shine line and everything. And then I decided to add some sugar on top. And for some reason, that made me think about an image I had seen somewhere. An apple with a mustache. It had to be done. And then naturally, the mustachioed apple also needed a bowler hat. Because if you have a mustache and NO bowler hat....total creepsville for apples.